A hospital opened on this site off Swanmore Road in 1849 'for the relief of the sick and disabled poor from all parts of the Island', it was then known as the Royal Isle of Wight Infirmary. The first building, designed by local architect Thomas Hellyer had space for 20 beds. Over the years, buildings were added for additional wards, out-patients and auxiliary functions until the hospital spread from Swanmore Road to West Street along one side of Milligan Road. With the coming of the National Heath Service in 1948, management transferred from the local committee to the Management Group covering most of the Island Hospitals. 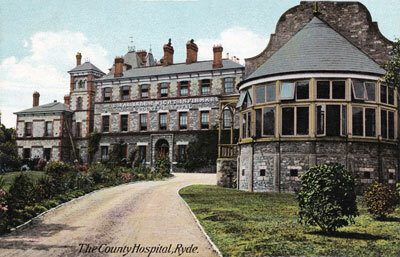 The main wards and functions at Ryde closed in 1992 leaving just an out-patients department in West Street. The only part of the previous hospital to survive (2014) seems to be Milligan House in West Street which was built in 1880 as the Milligan Convalescent Home, the plaque over the door reads 'In loving memory of Robert and Elizabeth Milligan, this building is erected by their daughter Sophia Milligan'.